Organised by entrepreneur Ron Maydon and his partner, ex-Lola and Panoz director Chris Tate, The Masters Historic Racing Series added to its series for Grand Prix cars from 1960s and 70s with the acquisition of the former Historic Group 4 events last winter. Now called the ‘World Sportscar Masters’, and aimed exclusively at Group 4 and Le Mans prototypes of the period 1964-74, this prestigious series had a strong first year in 2005, with race formats being varied - either two separate half hour races over a festival weekend, or a straight one hour mini-enduro, with compulsory pitstops, and the option of driver changes. The season’s overall star – it’s not a championship – was clearly Portuguese Carlos Barbot in his immaculate Lola T70 MkIIIB, prepared by Lola specialist Clive Robinson. 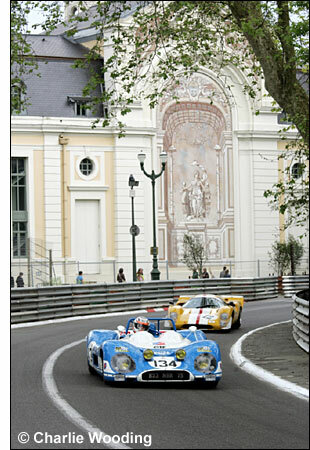 Here he chases Abba Kogan's Matra MS650 at Pau. Two wins at Pau set Barbot on his way, and he was competitive on every outing. In fact, Lola T70s were triumphant overall, with other race winners including Richard Meins at the Nurburgring, Andre Bailly at Zolder and Frank Sytner at Silverstone, sharing his version of the classic Lola (the ex-Sid Taylor T70 Mk III) with the ultra rapid Simon Hadfield. 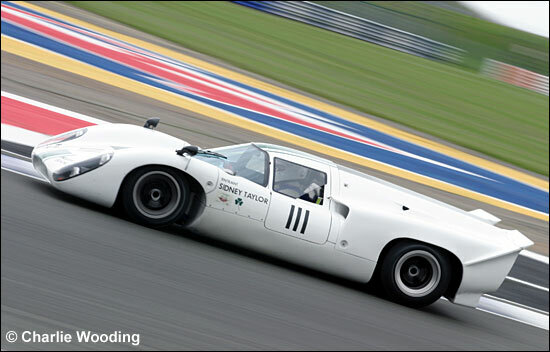 It was also good to see Peter Dunn in his earlier Lola Spider T70 enjoying success after many years of trying. 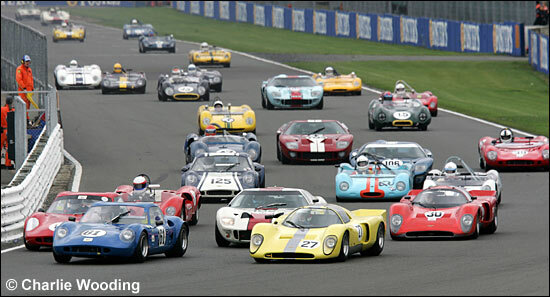 Behind the Lolas, the Chevron B8s were always a delight – good, clean fast racing from the likes of Jerry Hooper, Chris Chiles, Joe Ward and Andrew Schryver - even if David Methley’s unique Lenham coupe with its FVA could generally wail away into the distance for a class win. The WSM events are divided into classes named after sports car heroes of the period – Siffert, Pescarolo, Rodriguez, Hulme, Barth and Bonnier – and strong class battles, with fields drawn from all over Europe and the USA, set the tone for WSM’s first season. The series is set for major expansion in 2006, having closed out ‘05 at Spa with 38 immaculate and period-correct sports cars on the grid, and now with many ‘new’ cars set to take on the T70s – Ferrari 312 PB, Lola T280, Alfa Romeo T33/3 – promised for 2006, on tracks to be visited including Brands Hatch, Pau, Dijon, Silverstone, Nurburgring and Spa. The Masters has also acquired control of the two well-established Gentleman Drivers series, one for pre-65 GT cars and the other for pre-65 sports racers, so the new year promises to be a busy one. One of the reasons for the expected growth in WSM grid sizes in 2006 is that owners and collectors and historic preparers can now expect to attend a Masters Historic Festival and run a car in at least four events, if they wish. The historic scene is changing fast across Europe - and The Masters Racing Series welcomes interest from event organisers, preparation companies and owner drivers alike.